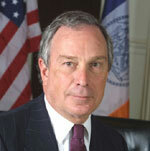 14 May 2006: According to his deputy Linda Gibbs, New York City Mayor Michael Bloomberg believes that "every New Yorker who can work should work." Acting on this belief, the mayor has just refused to extend the period during which an able-bodied adult can get food stamps beyond the current three months. The mayor is, of course, entitled to his beliefs, but not when hundreds of thousands of New Yorkers will be harmed. As a result of his refusal to extend the availability of food stamps, 14,000 poor workers who can't find decent paying jobs will now be forced to accept whatever low wage jobs are being offered to them. And when they do, they will exert a downward pressure on the wages of other workers as well. The mayor's policy is not only cruel, it's anti-labor. In fact, for low-wage New Yorkers Bloomberg Time has been even worse than Giuliani Time. Since 2001, the median wage of workers with low levels of education (high school or below) has increased by a mere 25 cents, from $9.75 an hour to $10 an hour. When adjusted for inflation this constitutes a 10 per cent decrease. Not surprisingly, this has resulted in higher poverty. In 2004, the last year for which this figure is available, the rate of poverty in NYC was 20 per cent, as compared to 19 per cent in 2001. There may be several reasons for these negative developments, but Bloomberg's anti-welfare policies have no doubt had an impact. On the one hand, Bloomberg has continued Giuliani's policy of removing people from the welfare rolls. Between 2001 and 2005, the number of welfare caseloads in the city decreased by 80,000. On the other hand, people who do get welfare have been forced to replace well-paid city employees through a variety of "programs" with doublespeak names such as the Work Experience Program (WEP), the Parks Opportunity Program (POP) or the Parks Career Training Initiative (PACT). Between 2001 and 2005, the city's workforce was reduced by 15,000 workers. How many of these workers lost their jobs to welfare recipients is not known, but the Parks department alone employs 6,000 WEP workers and 4,000 POP workers. Welfare recipients are also forced to work in other departments, but those numbers aren't available. "Work-at-any-wage" has become such an idee fixe that even advocates for the poor are reluctant to fight for welfare. Education, training and career ladders are now widely seen as the solution to poverty. But in New York City, which has close to 800,000 workers whose highest educational attainment is high school, this is a diversion and not a serious proposal for how to raise wages. And in any event, the jobs that these workers with low levels of education do are all socially necessary. They include home care nurses who take care of the old and the sick, janitors who clean offices and schools, and retail workers. They are also security guards, cooks, and childcare workers. 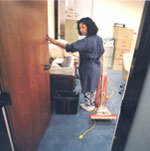 Even if everyone could have a Wharton MBA or a Columbia law degree, we'd still need people to do these jobs. The problem is not that these workers do unnecessary jobs, but that they're paid too little for doing essential jobs. The median hourly wage of home care nurses is $9.15. For janitors, cooks, and security guards it is $10. Child care workers make just $9 an hour. No New York City family can possibly live on such low wages. The workers are poor because they get low wages and they get low wages because they are poor to begin with. Because they have little savings they are unable to take the time to look for better paying jobs, and when they are offered jobs, they are in no position to negotiate. Contrary to what Mayor Bloomberg believes, a policy that permits people to get on welfare rather than to accept wages they can't live on would actually reduce the need for welfare by forcing employers to pay a living wage. Rather than believing that every New Yorker should work it would be better if the mayor believed that every New Yorker who works should earn a living wage. *Moshe Adler teaches economics in the department of urban planning at Columbia and is the director of Public Interest Economics, a consulting firm. He can be reached at: ma820@columbia.edu and via his website www.columbia.edu/~ma820. One of the poignant questions that Hurricane Katrina raised was this: How could so many people be so poor for so long without anybody noticing? But poverty is just as invisible in New York City as it was in New Orleans. The last five years of the 1990s were widely touted as years of a spectacular boom. Yet when Census 2000 was released, it revealed that poverty in New York City had increased by 10 per cent during the course of the 1990s. How could the euphoria of the boom be reconciled with the alarming census figures?